ONE-SHOTS GUITAR ROCK VOL. 1 – Welcome to EZ Edit Music ! 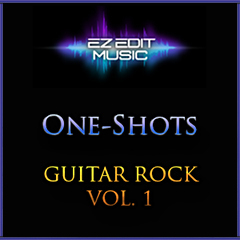 Similar to our "Rockin' All Night" looping collection, the "One Shots - Guitar Rock Vol. 1" collection is for projects that are looking for styles suitable for sports, outdoor adventure or high-energy moods; and for those requiring a defined song ending. "Off The Chain" (01:47) Stereo-mix only. "The Beat Down" (01:49) Stereo-mix only. "Southern Grit" (01:40) Stereo-mix only. "Against The Wall" (01:49) Stereo-mix only.